Rotator cuff injuries are very common, stemming from injury or repetitive overuse of the shoulder and these injuries can vary in the aging population. While rotator cuff tears are more common later in life, they also plague younger people, athletes and heavy laborers. The aging population is succeptible to rotator cuff injuries due to falls or strain the shoulder while performing every day activities. Left untreated, a rotator cuff injury can result in significant pain and a reduced mobility in the affected arm. This course provides therapists with valuable tools to give their clients complete freedom from shoulder pain. Clinicians learn about rotator cuff injuries, how to release the affected muscles and prevention of future injuries. This course also covers proper sleep position, stretching and strengthening exercises for the rotator cuff that are essential for the health of the shoulder joint. This course is a must for any therapist interested in helping their clients attain an injury-free state. This course is designed to instruct clinicians about rotator cuff injuries, how to release the affected muscles and prevention of future injuries. Identify nine techniques to precisely palpate and release the rotator cuff muscles. List the seven additional muscles that profoundly affect the shoulder complex. Identify seven techniques to precisely palpate and release the seven additional muscles that profoundly affect the shoulder complex. Label the anatomy/biomechanics of the shoulder joint. List five common causes of rotator cuff injuries. Identify twelve stretches and simple strengthening movements for the rotator cuff and associated muscles. Identify four simple strengthening movements for the rotator cuff and associated muscles. List fifteen ways to prevent future injuries. Target Audience: Physical Therapists, Physical Therapist Assistants, Occupational Therapists, Occupational Therapist Assistants, Massage Therapists, and Athletic Trainers. Peggy Lamb has been practicing massage since 1986 and is nationally certified. She received her initial training at the New Mexico Academy of Massage and Advanced Healing Arts in Santa Fe and at Wellness Skills, Inc. in Dallas. 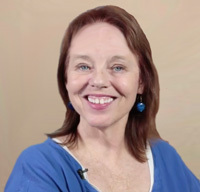 She taught Clinical Anatomy and Physiology, Trigger Point Therapy and Swedish Technique at Wellness Skills, Inc. and is now on the faculty of Texas Healing Arts Institute in Austin. Peggy holds a Masters Degree in Dance from American University in Washington, D.C. She also teaches dance and yoga and is a personal trainer. 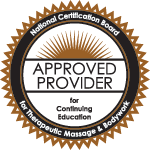 Peggy is an approved CEU provider for the Texas Department of Health, the National Certification Board for Therapeutic Massage and Bodywork and by the Florida Department of Health. She brings her eclectic and extensive background into her teaching for an interesting and enlightening learning experience.